It was easy enough to suppose, during the Obama years, that protecting the planet from the worst impacts of climate change was mostly a matter for heads of state and industry. Those efforts had been failing pretty drastically, of course—thanks in large part to a small handful of twisted energy industry billionaires who have blocked substantial legislative action on climate change since Bill Clinton’s failed energy tax in the early ‘90s—but one could be lulled into believing that responsible adults were doing the best they could. That fantasy has quickly imploded, at least in the world’s second-largest emitter of greenhouse gases. Donald Trump and the GOP-led Congress, joyfully hand-in-hand with oil behemoths, have embarked on a bid to rip apart every single environmental regulation they can get their tiny hands on, while considering reneging on the landmark Paris Climate Agreement. Faced with about a million slightly more immediate threats—deportation, hate crimes, police brutality, losing health care coverage, our crumbling democracy—we risk tuning the seemingly insurmountable issue of climate change out altogether. Garry Charnock, a former journalist and trained hydrologist, makes a compelling case for doing the opposite. Charnock, who lives in the English village of Ashton Hayes, has made headlines, along with his neighbors, for their decade-long volunteer-led project to become Britain’s first carbon-neutral village; their efforts have led to a 24 percent drop in emissions. Following a write-up in the New York Times last summer, Charnock was named one of Foreign Policy’s leading global thinkers of 2016. Hundreds of communities have reached out to Ashton Hayes for guidance since they got started with the project, and the town’s website is essentially a blueprint; it includes a community carbon calculator developed by the University of Chester, personal stories and advice for lowering household emissions from community members, and an in-depth guide for getting your own community project started. Garry Charnock in Washington, DC. Credit: Bryan Jungworth. Practically, a lot of us are pretty familiar with ways we could lower our own carbon footprint—turn off lights, switch to LEDs, eat less meat, unplug your gadgets, turn down the heat, offset or reduce your flights, use a water bottle, install solar panels and/or insulation, ride a bike, eat locally grown food, stop ordering everything on Amazon—but the idea of working together towards a specific target as a company, or an apartment building, or a neighborhood, scales those small efforts up enough so that they can begin to feel meaningful and worthwhile, even impactful. The following interview has been lightly edited and condensed for length and clarity. JEZEBEL: What has the response been like since the Times piece came out last year? GARRY CHARNOCK: The response was quite amazing. Immediately, we had CNN come to the village and do a film on us, and then we had Canadian broadcasting come on, so we’ve had a quite a lot of media interest. We’ve never had an American community in 10 years call us up, and since the article came out we’ve had about 10. The rest of the world has been contacting us all the time, but America has never really picked up on the idea. But it seems like there’s been a shock in America, people are thinking about things a bit more. [We’ve gotten] lots of emails and letters from people saying, we’ve looked at your website, this is the kind of thing we want to do. Can you tell me a bit about how the carbon-neutral effort got started in your village? When we started right at the beginning, one of the first things we said was that we will not allow politicians to talk to us. They can come and sit in the audience, but we don’t want them talking to us, because we don’t think they have a long enough vision for this sort of thing; they operate in short windows between elections. It prevented political divisions within our community, because we didn’t ask anybody with a political bent to talk to us—and we have a lot of politicians who did come and just listen and walk around, which is interesting. You don’t have to engage with politicians, that’s what I would say. By making yourself known and getting in the press, it’s the politicians who want to engage with you. That’s the difference. But to answer your question, in 2005 I listened to a talk about climate change by government people and by the head of Shell, and they were talking about what a government can do about climate change, and what a big corporation can do, like Shell. And at the end of it, they turned to the audience and said, listen, we’re all in this together, and we can do stuff but you guys all have to do stuff, too, as members of the public. And that got me thinking about what could I do as an individual, and that’s when I came up with the idea [that] maybe I could ask my community to work together to become a carbon neutral community, and inspire others. So the first step was, I just went down to the pub and met some friends and just floated the idea with them, and they all got really excited and said ‘let’s give it a go.’ They all felt impotent about climate change, and they felt, if we did something together—first of all, we wouldn’t be seen as cranky people, if the whole community did it; we wouldn’t be seen as strange people. And secondly, they didn’t want to leave a problem for their grandchildren. That was a driving force for everybody. So it made people psychologically feel a lot better to be doing something, even if it’s a drop in the ocean. And we knew it would be a drop in the ocean, but what we didn’t realize is the support we’d get from other communities around the world, and from the media. There is a chance, once you start talking to people, that other people will follow suit. As a community, we always wanted to measure the impact of what we did. And when we started measuring, we discovered that quite a lot of people were flying a lot on business around the world, so they all started thinking about that, and they went back to their companies and asked if they could do more Skype-ing instead of flying. So one person reduced their flights by two-thirds, which is a huge number of flights—and also, it meant the family was happier, and the company saved money. So overall it was a good thing, [and] the whole company then started looking at doing teleconferencing for everybody. So that’s the sort of effect you can have just by asking a few questions. In your community, did you have to deal with people who didn’t believe in the science behind climate change? There weren’t many, but there were one or two. The guy who ran the pub thought the whole idea was crazy. So we had a policy: we don’t argue with people, we just kind of go around them. If they say they think it’s crazy, we say, well, that’s up to you, whatever. And then we go and talk to people who are more interested. In this case, he was telling people he didn’t think it was a good idea—but then one day he got this huge energy bill for his pub, and realized it was going to be quite difficult to pay his energy bill going forward. So he asked the team if we would help him to save energy. So we did, and the first month we saved 25% of his energy bill just by doing simple things—he was leaving his beer coolers on overnight when it was minus-one outside, and he was leaving the lights on throughout the pub, and switching the ovens on at 9 in the morning and not serving the first meal till lunchtime. So we helped him with that, and then he became a complete advocate. As an individual, what are some things that a person can do to reduce their carbon footprint that are fairly straightforward? Well, first of all, you can actually do things that are beneficial and save money. If you’ve got your heating on, just turn it down by one degree. You won’t notice it, but it saves you money. If you boil the kettle for water to make a cup of tea or coffee, just put the amount in that you’re going to boil, not two or three times as much. If you’ve got your fridge on, just turn it down, don’t have it too cold. It’s always little, minor things. In your household, for example, we’ve discovered that changing your lightbulbs to LED bulbs saves about 85% of your lighting bill. You can read your meter to tell how much gas and electricity you’ve been using. So what we did was, we asked everybody for their readings—if you know how much gas you use, there are formulas that tell you how much carbon is emitted. There are some simple things you can do, like taking a meter reading one year, and then at the end of the year, change your behavior and see how the meter reading changes. Generally, we found that it was dead easy to save 20 percent on emissions straight away. It gets harder, then you have to start thinking about solar panels, but I would suggest people just take a reading and then do something and see what happens. So, look at your lifestyle. A lot of people, for example, stopped using the tumble dryers which are very energy-intensive, and started drying the wash on the clothesline in the garden when there’s good weather. People started taking the train a lot more rather than flying, and people started offsetting their flights. The other thing we did is, whenever someone did something that had a big impact, we shared the information. That’s been the trick. So if you save half your energy bill through these things, we would do a little story on one of the houses and tell everybody in the village. People in the village know each other, and there’s no reason you wouldn’t trust someone who’s telling you this. So it has a big impact when you share between friends and neighbors. When you start thinking of bigger, more time and energy-intensive things you can do, what are some options? A lot of people started using log-burning stoves instead of coal-fire systems. 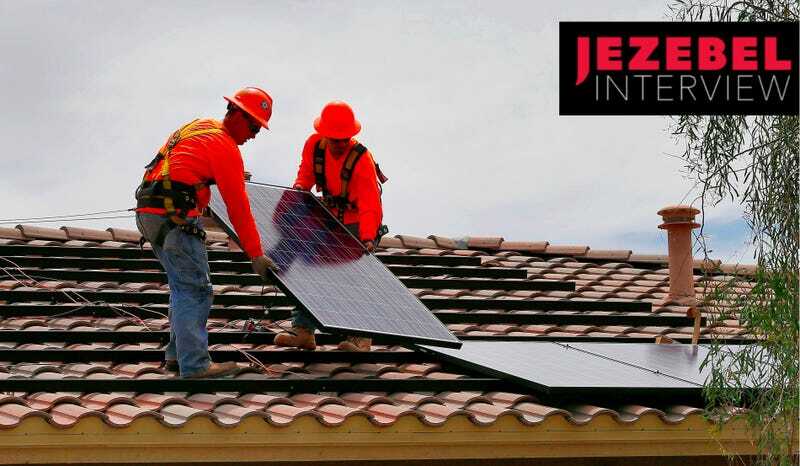 People started installing solar panels on their roofs, and that became quite a big thing. We started a community energy company, and we started installing solar panels on the school roof and the public buildings. And now the school gets free energy for half the year from these panels. What was the cost like for all of those measures? It was quite expensive. [Back then], we got a government grant to do it, because the government was trying to encourage uptake of solar panels. But now they’ve come down to a point where there’s no need for grants really anymore, they’ve become so economical. So we were kind of demonstrating on these buildings, but now we’re installing more and more. The energy company generates energy from the solar panels and things, we sell some of that back to the national grid, and we generate an income of about $20,000 a year for the community, and we use it for maintenance of some of our recreation facilities, and things like that. Back at the beginning, we had no money for this project. So I rang round all the local companies I could find, and asked [if they could] give us some money to kick off this project, and we’ll put their logo on the literature. Within two days we got $5,000 in checks from these companies, and they said it’s because all our staff are asking us to get more involved in protecting the environment and we think this is a really good thing. And they didn’t just give money, they said, can we give you people, or skills, or photocopying, or exhibition materials? So we suddenly had this support from companies. And as time has gone on, we’ve had support from lawyers in London who want to give free legal advice. So society has helped us, people with different skills have helped us, that’s an important part of this. When it came to government, the local council asked us what they could do, and we asked them to help us get to the nearby railway station a bit more easily. We had a railway station about half a mile from the village, but people didn’t use it because the road was too dangerous to walk along, there was no footpath or pavement. So they built us a footpath, and we’ve seen the use of trains go up about four times. So those things are really important, because the council gets a good reputation for doing it, and society accepts that the council is really working with us. But what we didn’t want was the council to come in and just tell us what to do about saving energy. So in the U.S. things are a bit more spread out, and a lot of the more liberal-minded folks are concentrated in cities. How can this concept work in a more urban environment? You have to break down everything into small areas, small pockets where there’s common ground. For example, in London there’s a project called Repowering London, in Brixton, and they’ve worked to [facilitate community-owned renewable energy projects], and they set up a training school for unemployed people to build these solar panels. We’re seeing other places where one person on a street will go and invite all their neighbors for an evening’s drink, and they’ll say, can we work together as a street to improve our recycling? Can we work together to change our energy use? And by doing this, what you find is a real social spin-off—people getting to know one another, improving the fabric of society, if you like. When you get a school starting [to work towards carbon neutrality], get the parents involved and the children, that does permeate the community. In Ashton Hayes, the school has been the biggest catalyst for us to keep going, because the children go home and encourage their parents and their brothers and sisters to do things. We’ve all heard about changing lightbulbs, installing solar panels—is there anything you’ve done to reduce your carbon footprint that might come as a surprise? A lot of it is obvious, I think. The thing that isn’t obvious is to make it owned by the community. Society has been built on a top-down system of big power companies selling us energy. We’re trying to say, can we sell our energy through your wires, and some are saying yes, some are saying no. You can only do things that are within your own sphere of influence. You can’t influence nuclear power stations, you can’t influence the way airlines operate. But you can influence what goes on in your own life.